Billboard recognized as Super Rookie Global K-pop Idol EVERGLOW. 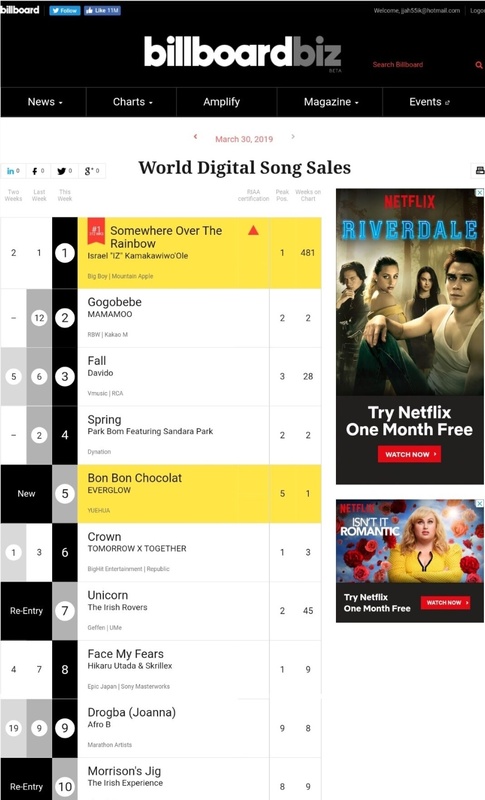 EVERGLOWs 'BON BON CHOCOLAT' Showcase ranked fifth on the Billboard World Digital Song Sales Chart. Billboard praised EVERGLOW's debut performance by making it into fifth place on the Billboard World Digital Song Sales Chart upon its debut, featuring "One of the best ever K-pop debuts." EVERGLOW said “it was the sixth K-pop idol to enter Billboard World Digital Song Sales Chart TOP 5, following Red Velvet in 2014, Black Pink in 2016, LOONA in 2018, ITZY in 2019. After topping the iTunes K-pop chart in 19 countries, Apple Music K-pop chart in 21 countries, K-pop chart in the K-pop chart in the top 10 spots in the K-pop chart, the Billboard World Digital Song sales chart in 5th place, the performance of EVERGLOW, which is recognized as a global K-pop idol, is drawing attention. EVERGLOW recognized by Billboard, has been growing as a global artist representing K-pop, with their YouTube video of BON BON CHOCOLAT, YouTube views as well as reaction videos and cover videos of K-pop fans around the world.